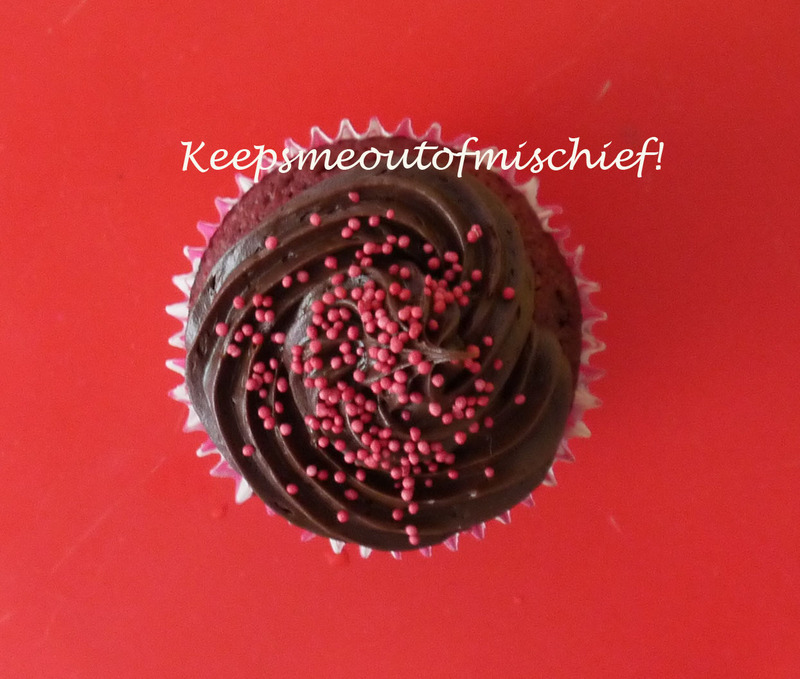 A Tale of Two Cupcakes | Keeps Me Out Of Mischief! It’s been such a busy Easter holiday. I’ve been flitting here and there like a social butterfly! Well, flitting as much as you can when you’ve consumed a ridiculous amount of Easter Eggs! On Good Friday I met up with my old work colleagues for a take-away and a gossip. 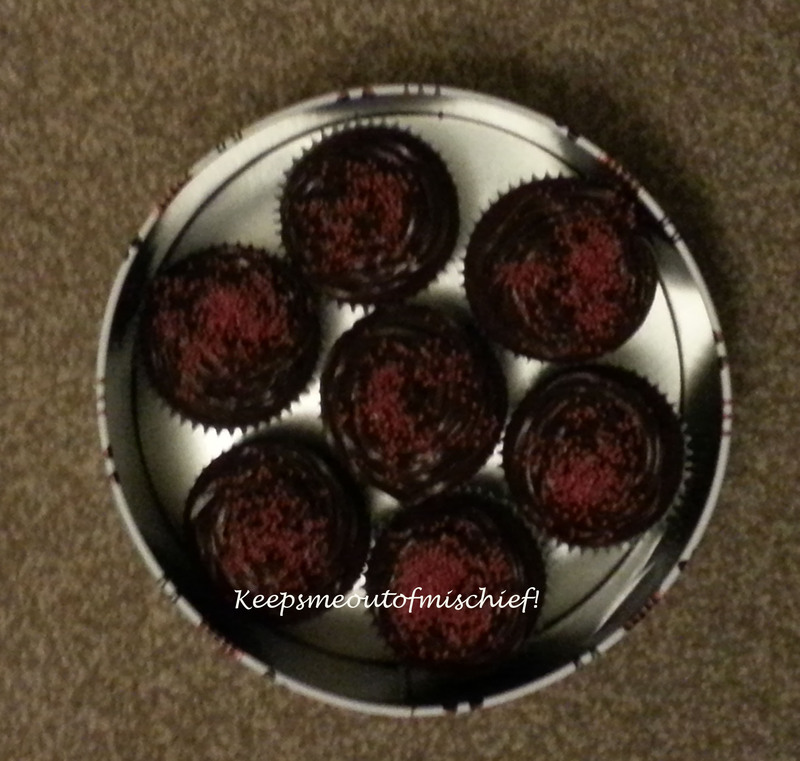 I offered to bring cupcakes for pudding so I quickly whipped up a batch of my Red Velvet Cupcakes. Recently I’ve been absolutely fine when mixing the ingredients for a cake batter as Little B will help me, but it’s not been as easy to decorate them. Once he smells them when they come out of the oven, all he wants to do is eat them! I’ve also had more time to wander round the super market this holiday and found a couple of products I wanted to try, so on this occasion I used Dr. Oetker’s Chocolate Cupcake Icing. I used to be a complete snob about products like this – but that was B.C! (before child) Bring on the products that make my life easier! The can was a little bit fiddly to use initially and made a bit of a mess as there seemed to be a lot of air trapped in the can. It tasted pretty good though. On Easter Monday we had a family barbecue at my sister-in -law’s house. Once again I took a batch of my Red Velvet Cupcakes but this time I used the Betty Crocker Chocolate Fudge Icing. This was definitely the winner. You put it into your own icing bag and pipe away so you can feel where the air pockets are so it doesn’t explode everywhere. It was deliciously creamy and rich and looked better on the surface of the cupcake than the previous effort. Would definitely buy this one again in an icing type emergency!